Time : 4 – 6 pm. Agenda: All Deepam volunteers ganging up to meet and discuss about future plans. 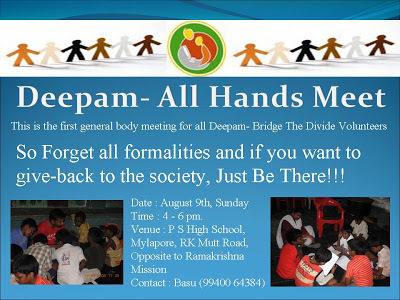 This is general body meeting for all Deepam- Bridge The Divide Volunteers. If you are getting mails from from the google group : [email protected], or receiving this through a mail, or hearing this from a friend you can simply walk in. 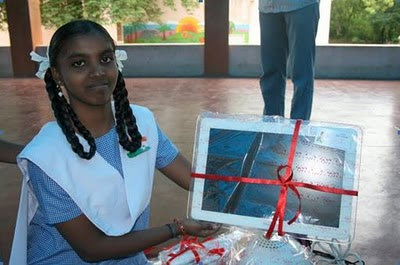 Forget all formalities, if you want to give-back to the society, Just Be There!!! 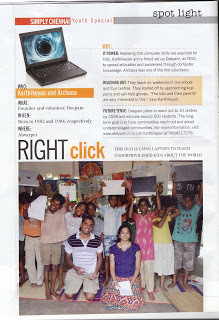 PS : Thanks Gopal for arranging this venue for all of us.